fun – Page 51 – Cool San Diego Sights! 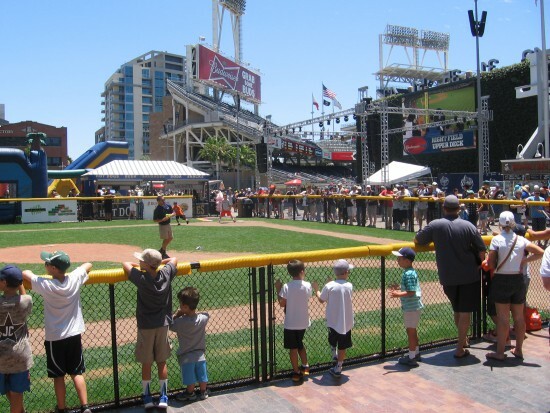 Kids enjoy tiny ball field at Petco Park. Downtown residents and visitors to East Village have access to a great public resource. Green grass, shady trees, a large playground, and views of the city can all be freely enjoyed (when the San Diego Padres aren’t playing a home game) at the Park at the Park! 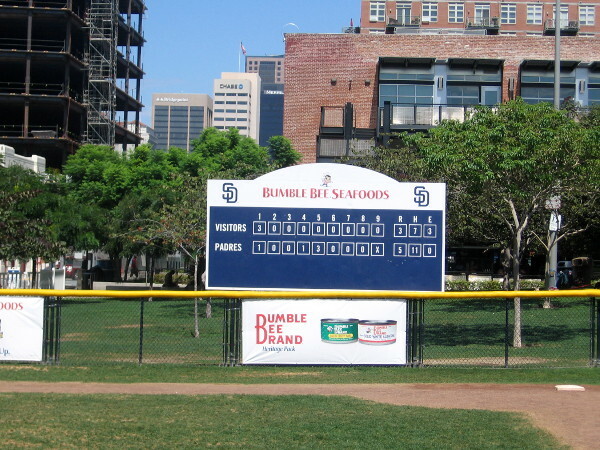 Situated beyond Petco Park’s outfield, surrounded by sleek city buildings, this public park has a small ball field which is perfectly sized for children. In this pic, taken near the end of the baseball season (the Padres were in San Francisco), a family is seen walking across the diamond. Those patches of bare dirt testify to the popularity of the park during the summer and long baseball season. 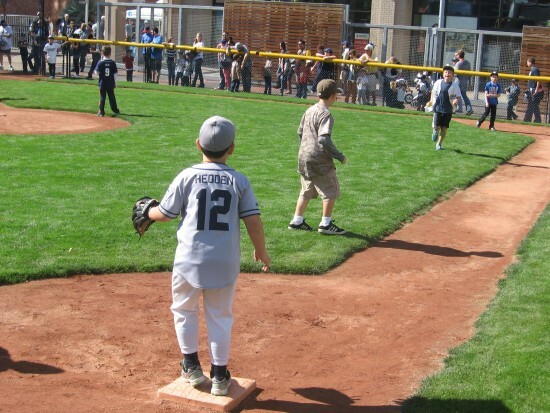 Kids enjoy small baseball field during Padres FanFest. Folks watch a game at the kids baseball field in Park at the Park. Scoreboard beyond outfield of tiny baseball diamond sponsored by Bumble Bee. Posted on September 30, 2013 August 8, 2015 Tags baseball, downtown, east village, fun, kids, padres, parks, petco park, san diego, sportsLeave a comment on Kids enjoy tiny ball field at Petco Park. 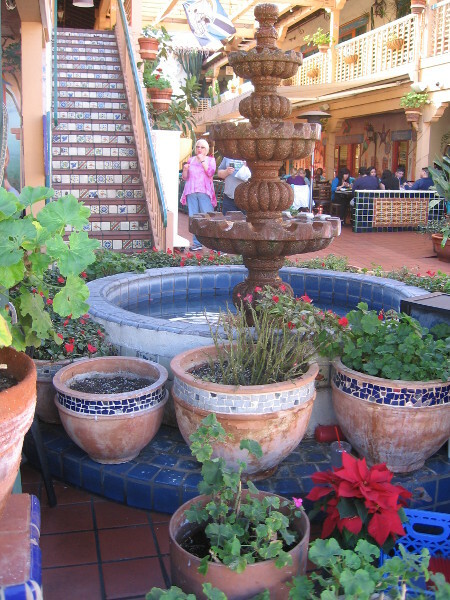 Mexican cafes and cantinas in Old Town. 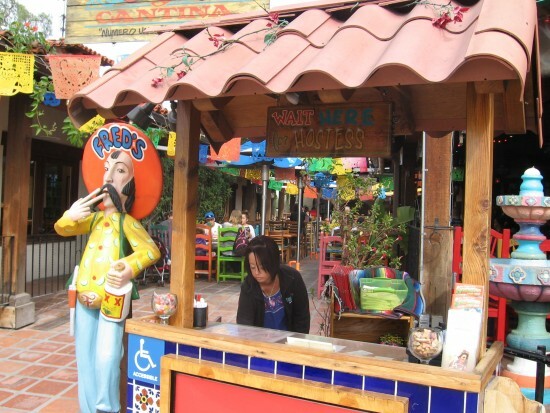 Just one of many colorful eateries along San Diego Avenue. 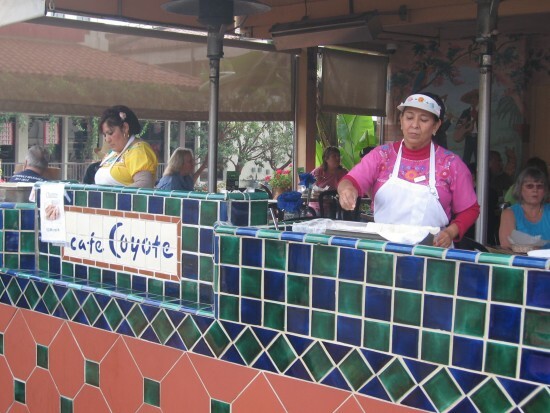 These pics offer a sample of the sort of Mexican-themed eateries one encounters in the commercial part of Old Town, which runs several blocks south of the State Park along San Diego Avenue. Lots of seating outdoors, an eyeful of festive colors and a cool, laid-back Southern California atmosphere. 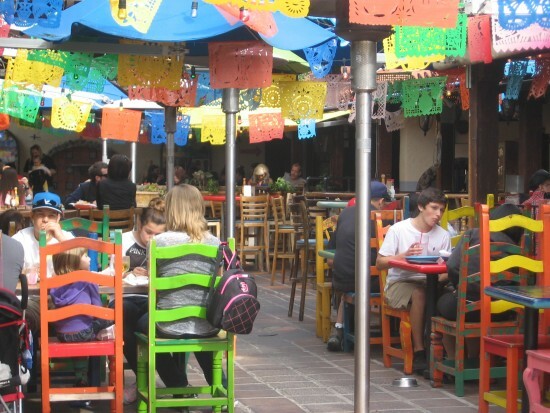 Eating great Mexican food outdoors in San Diego’s Old Town. Fountain and splash of color in courtyard of an Old Town restaurant. 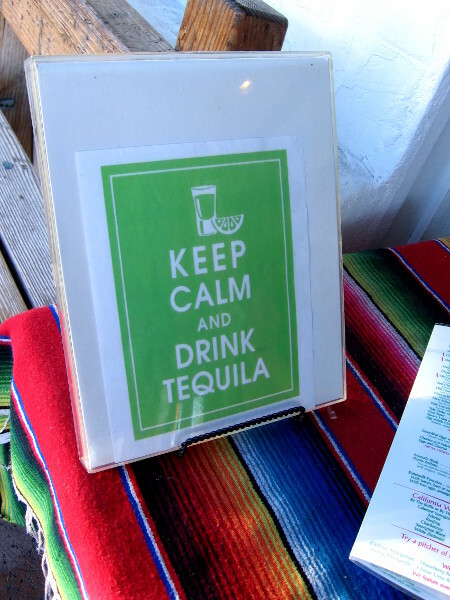 Keep Calm and Drink Tequila. 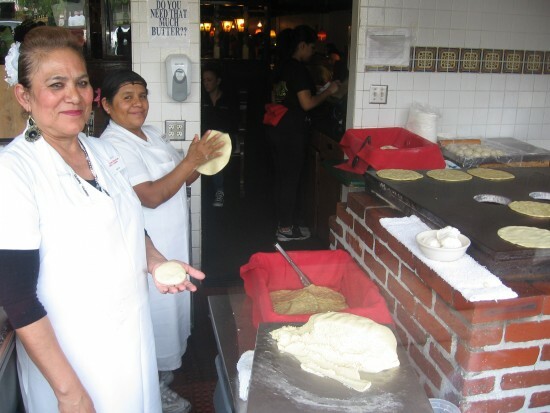 Old Town pedestrians can buy hot buttery tortillas. Ladies prepare fresh tortillas for people passing on the sidewalk. Bienvenidos a Old Town! Where great food and a festive atmosphere mingle with San Diego’s rich, colorful history. Are you visiting from Pinterest? To see hundreds of fascinating pins from beautiful San Diego, please visit my Pinterest page! 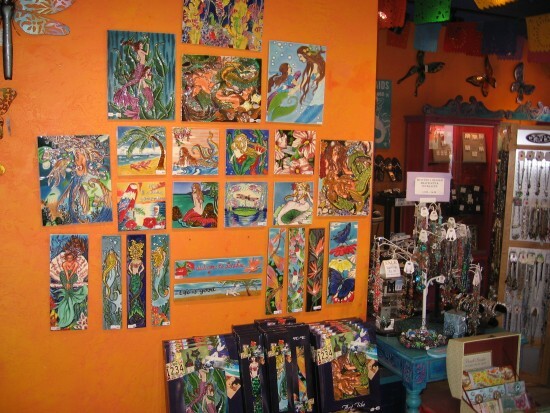 Posted on September 26, 2013 February 28, 2018 Tags color, cool, dining, entertainment, food, fun, mexico, old town, restaurants, san diegoLeave a comment on Mexican cafes and cantinas in Old Town. Colorful market on a corner in Old Town. The Old Town Market is one very popular destination. Little shops selling all sorts of colorful souvenirs, curios and crafts can be found everywhere in Old Town, both in the State Park and in the touristy area just to the south. Many of the items for sale are Mexican in origin or style. 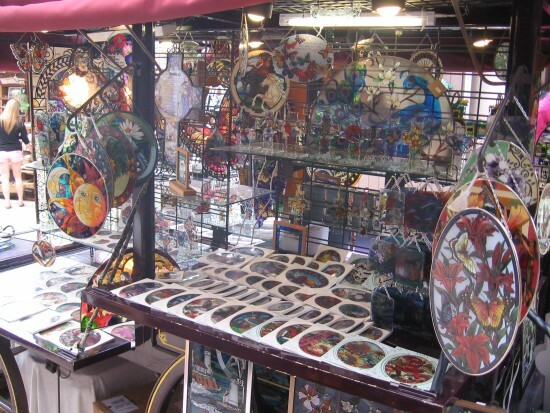 You can find pottery, painted tiles, jewelry, maracas, pinatas, lucha libre masks, and all sorts of unique leather and wood-carved crafts. A few stores have a Western theme and sell cowboy hats, boots, Native American art and other stuff related to the American frontier experience. It’s fun just to browse and soak it all in! 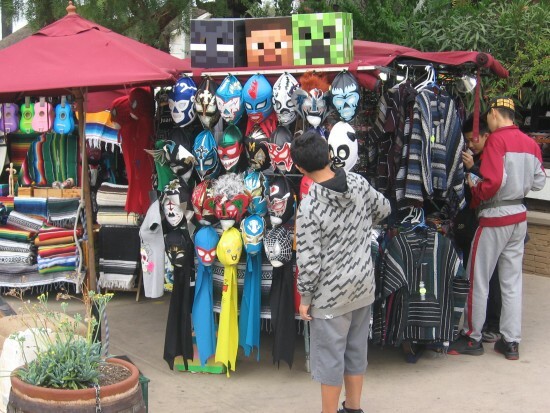 Kid checks out a bunch of Mexican Lucha Libre masks. 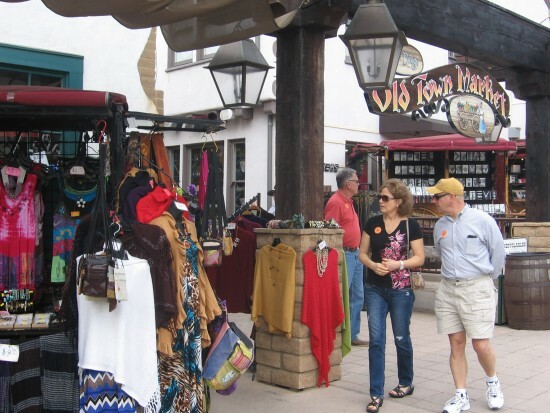 Tourists take a stroll through the colorful Old Town Market. 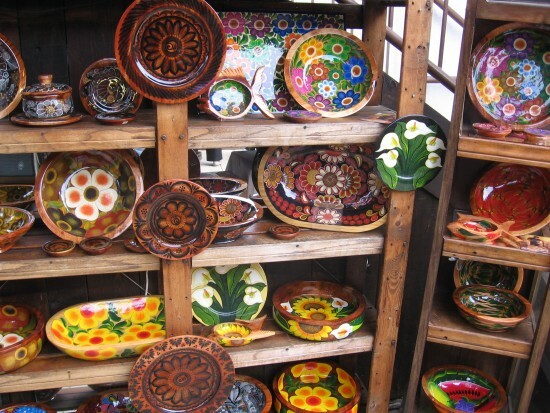 Very colorful pottery can be found everywhere. Painted tiles for sale hang on an orange wall. Vendor at Old Town Market at work with a power drill. Painted plates for sale in a corner of Old Town. 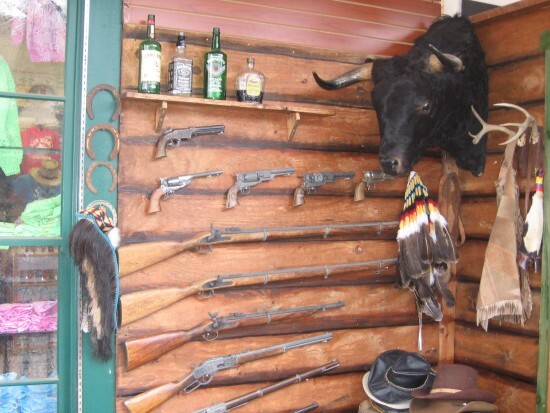 Many Western items on display in an Old Town shop. 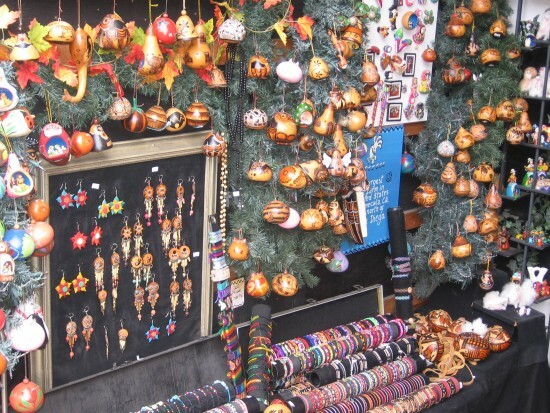 Hundreds of Mexican ornaments and trinkets. 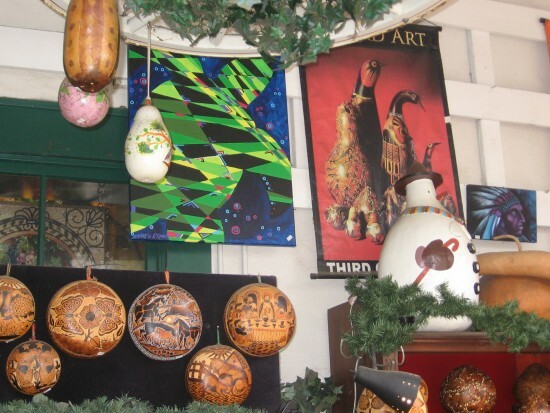 Colorfully painted gourds and posters. 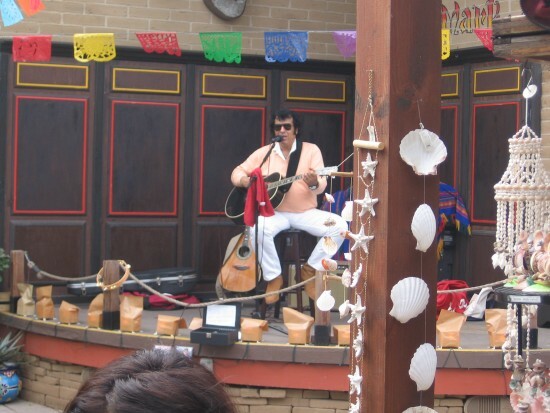 A guitarist performs for shoppers. 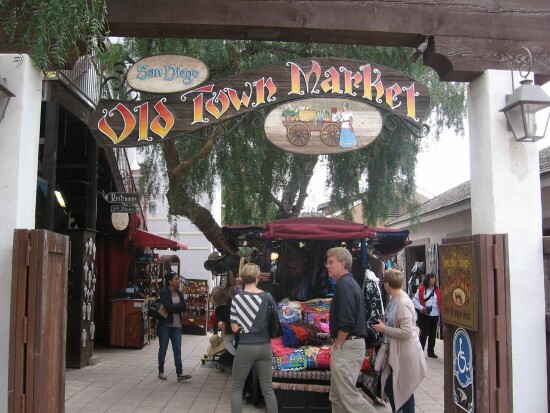 Posted on September 25, 2013 January 27, 2014 Tags color, crafts, culture, fun, old town, san diego, shopping, shops, tourism, travelLeave a comment on Colorful market on a corner in Old Town. Rabbits ready to tube race at Bunnyfest. Here’s another pic from Bunnyfest. Three rabbits are ready to compete in a big race! They’re poised before three burrow-like tubes, just waiting to be released… There they go! Which one will win? The one nearest the camera popped out of its pipe first! Just a sample of the fun stuff I observed today during my walk! Posted on September 24, 2013 December 27, 2014 Tags animals, bunnies, bunnyfest, events, fun, kids, life, pets, rabbits, san diegoLeave a comment on Rabbits ready to tube race at Bunnyfest. Girls at Bunnyfest trim nails of rabbit. Here comes another pic from Sunday afternoon! Walking back toward downtown, I happened to stumble upon Bunnyfest on the grass at the south side of Balboa Park. It was a surprisingly large event with lots of booths and activities, put on by the San Diego House Rabbit Society. Rabbits were everywhere! Big rabbits, small rabbits, ordinary rabbits, exotic rabbits . . . rabbits of every kind and description! In arms, in pens, and featured on many great works of art! I watched for a moment while two girl volunteers trimmed the nails of a bunny. Here’s the photo. Posted on September 24, 2013 December 27, 2014 Tags animals, bunnies, bunnyfest, events, fun, kids, life, pets, rabbits, san diegoLeave a comment on Girls at Bunnyfest trim nails of rabbit. Monsters, aliens and trolls on a Haunted Trail! Yikes! Look at the creatures I spotted lurking among the trees on the west side of Balboa Park! That big one looks like a gigantic bloody yeti with goat hooves. Watch out! What are scary monsters, aliens and trolls doing in Balboa Park? They’re being created for Halloween . . . to populate The Haunted Trail! Sunday afternoon I spotted the huge creatures under construction behind a fence. Look how high that bloody monster stands compared to the step ladder! I also observed a human dummy in an electric chair and loads of more weird, grotesque scenery. San Diego’s unique Haunted Trail has been raising goosebumps for years now. Looks like visitors to this dark outdoor “haunted house” will be in for a lot of screaming! Here’s the spooky castle-like entrance to The Haunted Trail! Posted on September 23, 2013 Tags aliens, balboa park, cool, fantasy, fun, halloween, haunted houses, monsters, san diego, trollsLeave a comment on Monsters, aliens and trolls on a Haunted Trail! 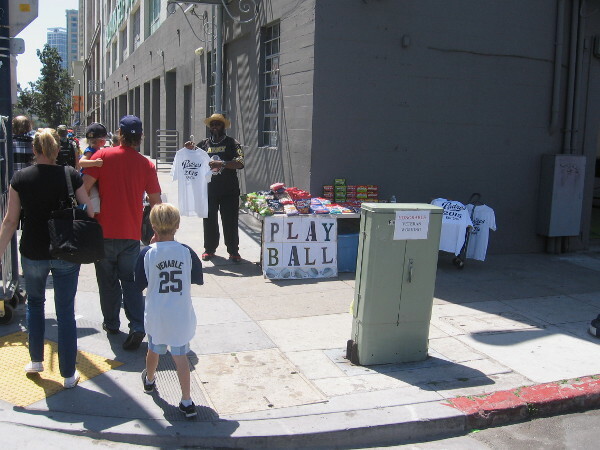 Padres fan gear vendor outside Petco Park. 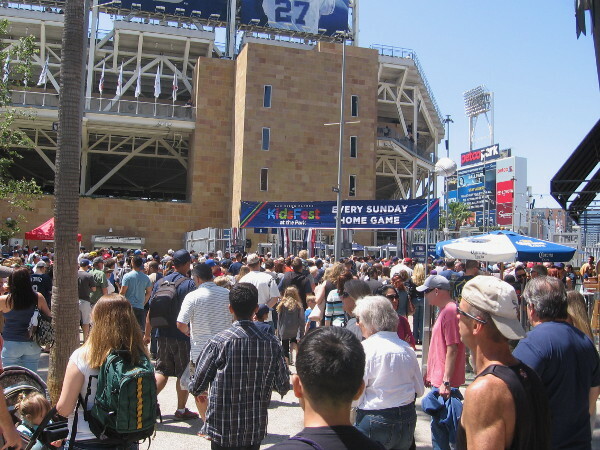 Late this morning, loads of Padres fans anticipating a great baseball game were entering Petco Park from its east side. Before filing through the gate and past the cool new Jerry Coleman memorial, they passed this colorful vendor. All sorts of Padres gear was on display for supportive fans. Sunny summer days of baseball are full of life, sounds, smells, color and pageantry. Going to a Padres game in San Diego is always a fun experience, win or lose! Padres fans converge on Petco Park for another baseball game. Any vendors at this entrance on opening weekend of the 2015 season are hidden by lots of excited fans! 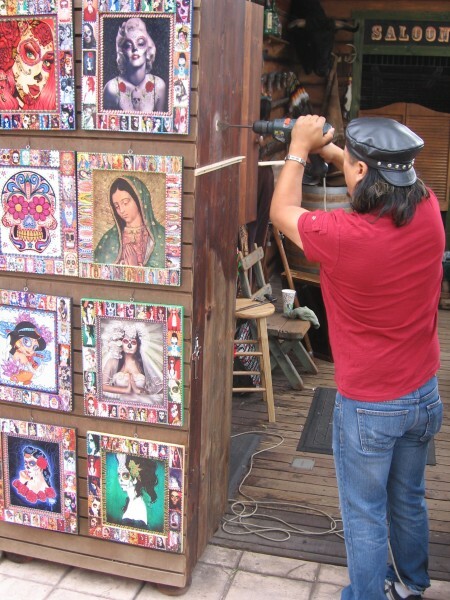 A smiling entrepreneur set up shop on a sidewalk a couple blocks from Petco Park. 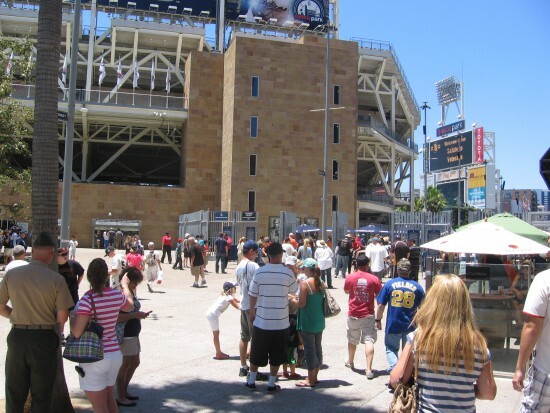 Posted on September 22, 2013 April 12, 2015 Tags baseball, entertainment, events, fun, life, padres, petco park, san diego, sports, summerLeave a comment on Padres fan gear vendor outside Petco Park.